Childbirth is the greatest and the noblest work in the world. Women’s health is damaged for the rest of their life if they don’t receive proper afterbirth care. Recovery time is essential to restore your changed body after the delivery. If you neglect it, it can affect your health but also your baby’s. Korean esthetic brand Yakson House’s CEO Lee Byung cheol explain you how to cleverly do postpartum care. The period where woman’s changed-body returns to its original state is called postnatal period. This postnatal period lasts from six weeks to eight weeks after childbirth. In general, you can start your postpartum care 3 weeks after childbirth if you had your baby naturally and 3 months in the case of Caesarean section. In that period, mothers’ immunity declines and their muscles and joints become weak. Moreover, edema comes out and different wastes remain in the body. To fight these problems, strengthen your muscles by doing light stretching and relax your edema with soft massages. But the best solution is to receive a postpartum care that will effectively adjust your body, especially pelvis. Once the baby comes out, it’s very important to keep your body warm but be careful not to be excessive since sweating can cause troubles in your metabolism. So find the right temperature that will help you to rest comfortably. In addition, cold wind and foods that are cool, flour based and hard should be avoid. Different secretions such as lochia and sweat are excreted so take 10 minutes warm shower. Taking a bath is possible six weeks after and using public bath three months after the childbirth. If you neglect postnatal care, you can have postpartum stroke, a disease that creates different sorts of pain in your joints. Most of women who already experienced this symptom suffer the same trouble during their menopause. That’s why receiving postnatal care at a right time is very important. If a mother agonizes from it, she can’t focus her attention on her baby and this can cause problem on baby’s emotional sides. Other than mother and child’s health, extra fat gained during the pregnancy is a big stress for women. They especially suffer from stretchmarks but these ones can be removed with diet. Change your eating habits and do light exercises. widen-pelvis back and tightens flabby stomach and chest. With this, you can have a body line better than before pregnancy and a fast recovery. Wanna have a smaller face? slim body? balanced body and face? 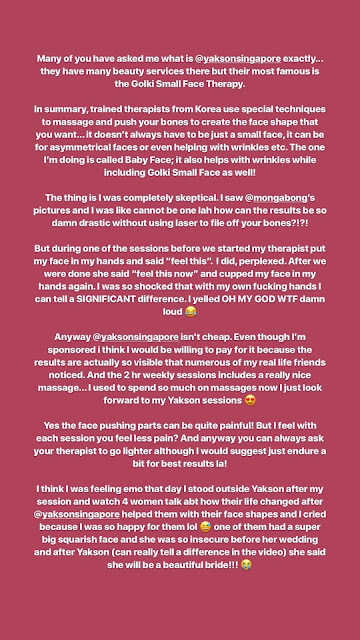 Please come to Yakson Beauty and receive our face and body therapy. Hi Yakson Beauties :) Several Yakson Beauty Editors are sharing their great experiences from global Yakson Beauty branches! Many people decided to be on a diet for the New Year. However, the resolution to go on a diet is always short-lived. Today, I will give you a list of good food for loosing belly fat. Cinnamon has a warm temperament that activates gastrointestinal function and is used for alleviating abdominal pain and diarrhea caused by digestive disorders or abdominal pain. Cinnamon also has good efficacy in burning and distributing body fat. seaweed is abundant in calcium. Seaweed is a low-calorie, low-fat food that is good for diet, dietary fiber is abundant and gives a feeling of satiety to stimulate intestinal motility to prevent constipation. Helps to release fats and salts in the blood and helps with cholesterol. Bananas are high-calorie, high-sugar, alkaline foods. It also contains potassium, carotene and vitamin C.
As a typical diet food, it is 75 ~ 130Kcal per banana. Eat it as a snack. It makes you feel full and it is effective for diet. Apples are alkaline foods with fewer calories and contain a lot of good ingredients for your body. Dietary fiber prevents the arteriosclerosis by releasing the harmful cholesterol that builds up in the blood vessels and increasing the beneficial cholesterol. It also helps to prevent and treat hypertension by releasing saliva from the body. Cherries produce uric acid that helps lower cholesterol levels, helping to metabolize and reduce hunger. Cherries are rich in antioxidants, which prevent oxidation of cells and are therefore excellent for preventing disease and aging. It is also good to have cherries if you are suffering from sleep disturbances because it reduces inflammation and helps with melatonin production and secretion. Here are some good foods that help to loose belly fat. Above all, proper exercise and diet are important for loosing belly fat.